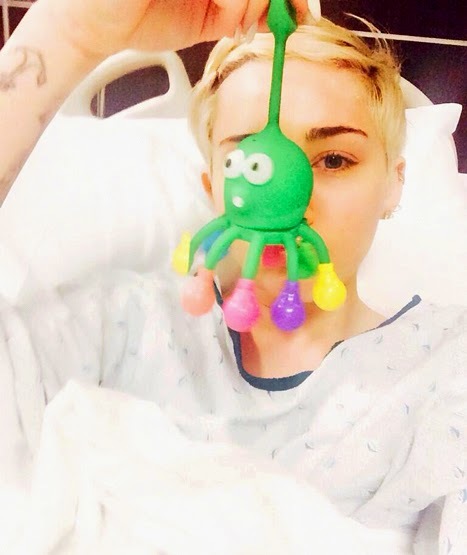 SnapCacklePop: Miley Cyrus in Hospital..! The Wrecking Ball singer tweeted today a picture of herself dressed in a hospital gown saying she was “heartbroken” as she had to cancel her Bangerz concert in the city after she was hospitalised for a severe allergic reaction to antibiotics confirmed a spokewoman for the 21 year old. The rebel with no cause said in the tweet "Kansas I promise Im as (heartbroken) as you are. I wanted so badly 2 b there 2night. Not being with yall makes me feel s***tier than I already do,"
Well MIley, we hope you recover quickly and can we offer some advice, we think you need to release the funky jam On My Own as your next single. Just saying. Bangerz is available on iTunes including our recommendation for her next bit hit..!